Anti-static Weighing Canoes are designed for accurate weighing of static-affected material. Weighing Canoes are made of recyclable virgin polystyrene with 109 ohm2 resistivity. Contoured sides provide a convenient non-slip gripping surface. 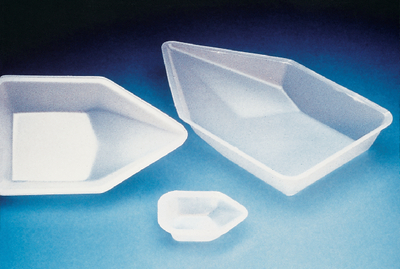 Canoe shape allows easy pouring of weighed samples. Available in three sizes.